Bright four-room apartment with two large terraces furnished with tables and armchairs. The rooms, all with balcony, are spacious and well furnished, equipped with every comfort. Air conditioning hot and cold included, timed oil radiators .. The bedrooms and the living room are equipped with flat screen satellite TV. Free Wifi throughout the apartment. Full kitchen equipped with oven, large fridge-freezer, microwave, barbecue, kettle, coffee machine 'long, pots and stovoglie, plates, cups and cups, cutlery and glasses for 8 people. Ideal for families, the apartment is equipped with a cradle complete with crib linen, electric towel warmer-warmer, high chair, stroller, baby bath (available free of charge, to be requested at booking). Two bathrooms, one with bath and shower, the other with only a shower cabin. Laundry with washing machine, iron and ironing board. Linen for bed, bathroom and kitchen included. Garage included in the garage under the house (maximum car length 4 meters) .A 350 meters from the town center (within walking distance), from the Circumvesuviana station, from the Marinella beach, 500 meters from the swimming pool (entrance fee). A few meters panoramic bar overlooking the Gulf of Naples. 3km from Sorrento and the port from which to embark for Capri, Ischia, Amalfi and Positano. Possibility to rent cars, motorcycles and boats. Organization of guided tours in Pompeii, Royal Palace of Caserta, Naples, Capri. Available on request for a fee transfer from the airport to the property. For late check in (after 8 pm) € 30 will be required. Hi everyone!I wait you all in Italy to show you all the beauties of our country! toilet, combination tub/shower, shower, bidet, Bathroom with towels, shower,, etc. 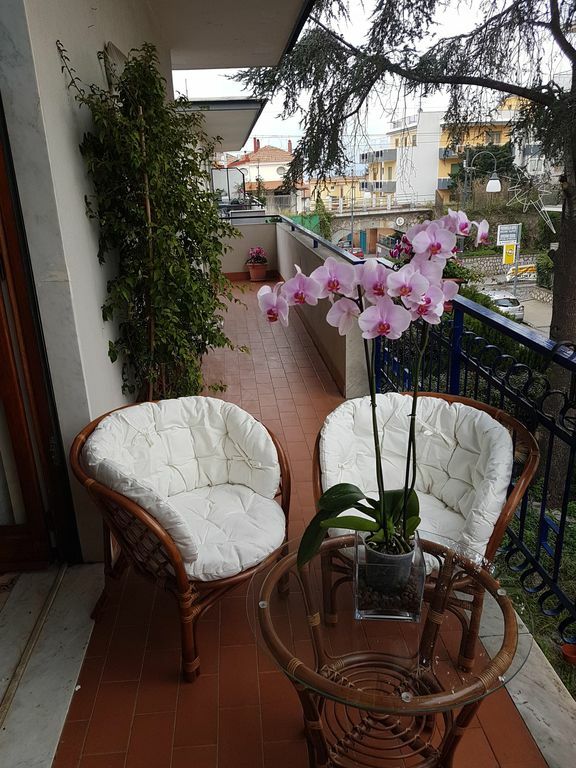 Our apartment is located in a strategic, central and quiet location to visit the beauties of the Sorrento and Amalfi Coast, not far from the excavations of Pompeii, Herculaneum, the Reggia of Caserta, Capri and Ischia. The home was very spacious. We are a family of 5 with grown children and there was plenty of space. Maria was an amazing hostess! She answered our many questions and even brought treats. I would highly recommend this location. It is a short walk to the train station and there are many restaurants and a grocery store nearby. Many thanks Alison!It was a pleasure to host you and your eonderful family!I hopw to have you again as my favourite guest in the future! !See you soon!!! Beautiful spacious condo with outdoor space. Robin C.Minneapolis Minnesota United States. Not only was Maria adorable, she was a wonderful hostess. She went above and beyond to make sure our stay was the best. She gave us directions to public transportation, restaurants, local activities, the beach and a pool. She gave us recommendations for tours to Capri. She made sure we had food to eat and gifted us a regional treasure, lemoncello. She alone made our stay wonderful, but the condo was amazing. It was very spacious,clean and charming. It was a 10 minute walk to the train station to enjoy the activities in Sorrento. The market was 10 minutes away and a wonderful caffe was a 5 minute walk. Our only regret was our stay here was the last part of our 2 week Italy trip and we were worn out. When we come back we will definitely be staying here again and making Sant’ Agnello our first stop. Maria and this condo was truly amazing. Many thanks Robin!I hope you'll come again and find me as my very welcome guest in the future!Thanks again for your review!People like you give me everyday the strength to go on and improve my job!I wish you all the best! !See you soon in Sorrento!! Spacious apartment in a reasonably quiet area with a great balcony. Large apartment, probably best suited for a longer stay by people who plan to eat in. That's not to say there aren't any good restaurants nearby. We had the best meal of our trip at Osteria Estoria, which is a ten minute walk away. If your bringing a car, make sure it has a good turning radius, parking is a bit of a task. The apartment comfortably sleeps more people than would fit in a car that can be parked at the property. I highly recommend having Maria arrange day trips for you. We very much enjoyed the Capri tour she set up for us, and wished we had done the same for Amalfi, and Positano. Many thanks James for your kind review! We are managing to find another free parking area nearby in orther to allow parking to cars longer than 4 meters.I'vr been very happy you appreciated my property and the tours i reccomended.I hope to have you again as my guests in the future! The apartment is located in Sant'Agnello, 1km and a half from Sorrento, near Pompeii, Capri, Positano, Amalfi, Caserta, Ravello, Ischia, Naples. It is centrally located, but quiet. The village offers breathtaking views like that of the Marinella with a view of the Gulf of Naples and Mount Vesuvius. Not far from the beautiful beaches of Massalubrense such as Cala di Puolo, Recommone and Nerano accessible by bus or car ... or the Marinella beach accessible ... by foot .. Le tariffe sono comprensive di tasse, wi-fi, costi di pulizia, lenzuola e asciugamani. COSTI EXTRA: Tassa di soggiorno€2,00 per persona per notte solo se maggiori di anni 18, dovuta da Aprile ad Ottobre Tassa di soggiorno pari a 1,50 £ per persona per notte ( dai 18 anni in su) dal 1 Aprile al 31 Ottobre. Check in o check put tardivo ( dopo le ore 20.00 costo 30 €).